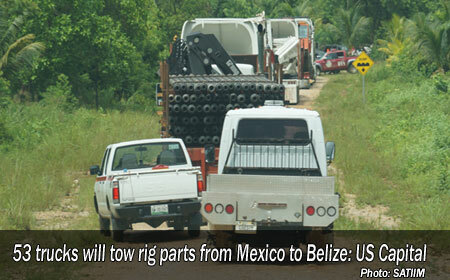 BELIZE CITY—Heavy trucks carrying the parts of a drill rig are being mobilized from industrial equipment supplier Pitsa, in Mexico, to Toledo in southern Belize, as US Capital Energy Limited, the company contracted by the Government of Belize to drill for oil in that part of the country, prepares to commence drilling in just over a week. Alistair King, US Capital’s representative in Belize, told Amandala this morning that the company is now trucking in the parts of the rig that will drill an exploratory well 800 meters inside the Sarstoon Temash National Park, amid high optimism that a commercial supply of crude oil will be found. The rig is being trucked in parts from Mexico and through the Toledo villages of Silver Creek, Santa Ana, Conejo and Sunday Wood, on 53 trucks, the final 15 of which are on the way. King told us that they hope to commence drilling within 11 days, on Monday, August 18, 2014, and he indicated to us that the company, which he said has spent up to $30 million, with the rental cost of the rig included, has met all the regulatory prerequisites needed to proceed. King said that two days ago, personnel from the Geology and Petroleum Department were onsite. Officials from the Department of the Environment, who will receive preliminary information from the Geology and Petroleum staff, are due to visit the location next week, King added. The company rep said that their optimism for striking a commercial find is “very high,” and area residents are “upbeat” over the prospects. He said that Sandor Ricketts and Hermil Warren, geologists of Horizon Mud Logging Services, which had done work for Belize Natural Energy (the only petroleum- producing company currently in the country) will be working with their drill team. Although the company is pressing ahead with on-the-ground works, representatives of the Maya communities surrounding the Sarstoon Temash National Park, where drilling is set to proceed, have issued a statement, decrying what they believe was a pact between select Maya communities and the company, which, they claim, has kept them completely out of the loop. 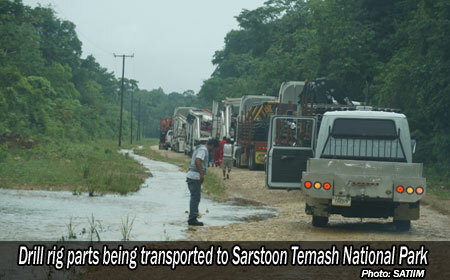 Martin Cus, Community Mobilizer for the Sarstoon Temash Institute for Indigenous Management (SATIIM), told Amandala Wednesday that they were shocked to hear that the two organizations had discussions with the oil company. Cus said that the buffer communities had formalized their statement after meeting in the morning with the chairmen and alcaldes of the named communities: Conejo, Crique Sarco, Midway and Graham Creek, who, he said, were not invited to the recent meeting with US Capital Energy. King said that there was an agreement reached, but that the agreement simply indicated that the company will keep the Maya leaders informed of progress. The statement goes on to say that the community leaders, in question, were not involved in the discussions and are not aware of the issues and concerns discussed and were not consulted, nor did their communities give consent to have the TAA leadership and the MLA engage in discussions with US Capital. “Under Maya customary law, our communities retain the decision-making power or authority and our right to self-determination and as such our communities’ position on oil exploration on our ancestral lands continue to be rooted in our claims that have been repeatedly affirmed by the Supreme Court,” the statement added. Cus said that they have received confirmation that the president of the TAA, Alfonso Cal, and the MLA spokesperson, Pablo Mis, were at the meeting. King confirmed to Amandala that Cal and Mis did meet with US Capital, and that these two men along with a third person whose name he said he could not remember, were taken to the drill site by Dr. Michael Tewes in US Capital’s company pickup, because the busload of persons who wanted to see the site could not visit due to the presence of heavy trucks and cranes on the site, which King said, posed safety issues. The four buffer communities have sought court redress, and the Supreme Court recently reiterated its call to the Government to obtain the free, prior and informed consent of the Maya in matters relating to activities on Maya ancestral lands, such as oil drilling. Since the parties had not made progress in their talks, the court issued an order for court-connected mediation with the buffer communities. Cus insisted that the meetings between the Maya leaders and the company have nothing to do with the court-ordered mediation, mandated by Supreme Court Justice Michelle Arana. King agreed that the meetings had nothing to do with the court order. He said that it was the Maya communities which had contacted the company requesting to visit the drill site. “This mediation still needs to take place,” insisted Cus, adding that no mediator has been picked and no date for mediation sessions has been announced. The Supreme Court is now in recess and no decision was made before the break began. “The [communities] clearly state that they are not against development, but they want to see how best they can negotiate,” Cus told us. Amandala called Mis, the Programme Coordinator of the MLA, several times for comment, but our calls were not answered.